Trucks, trailers, tractors – oh my! SEAFORTH – The rare treasure of a mild and sunny Sunday afternoon in November calls for a road trip. My hubby and I enjoyed the drive to Seaforth where we stopped at the annual Toy and Craft Show and Sale held at the Seaforth Agriplex and Community Centre. Admission was $5 a person for ages 10 and up. Before we entered the Agriplex, we were entertained by the sight of what I called the “push-me-pull-you” car. Two front ends of two separate vehicles had been joined together, each end with its own steering wheel and driver’s seat. The perfect car for the person who doesn’t know whether they are coming or going! 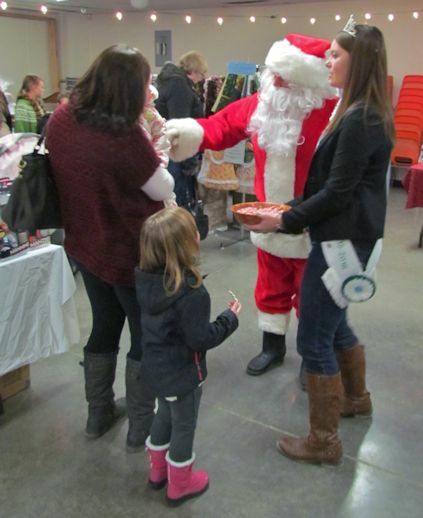 Inside the Agriplex, children were greeted by Santa and the 2015 Seaforth Fall Fair Ambassador, Maranda Klaver, handing out candy canes and good wishes. 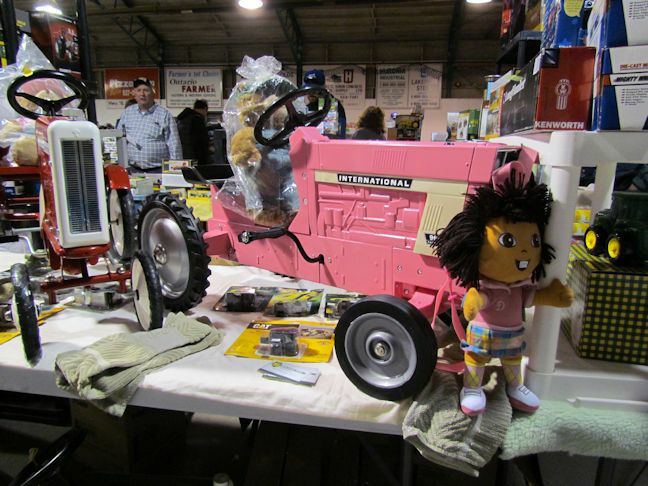 Farmers and little farmers-to-be were greeted by the sight of toy trucks, trailers, tractors and farm machinery in every size, shape and colour, including pink! 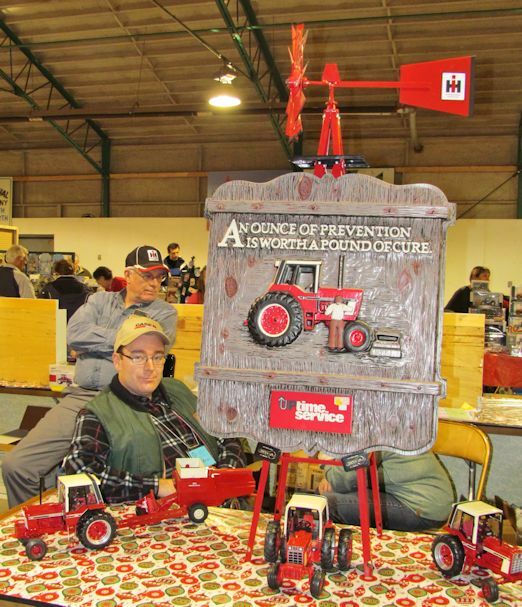 There were wonderful static displays of model farms and farm machinery. 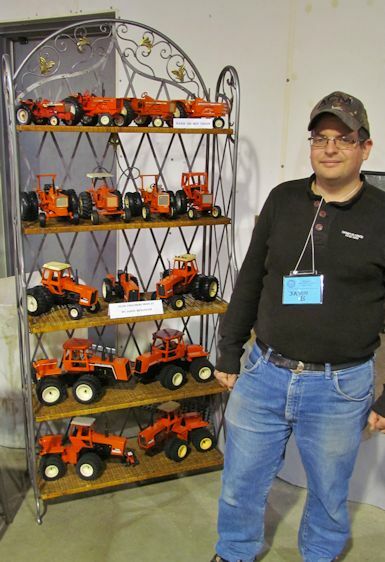 For the collector, there were vintage toy farm machinery, Pepsi and Coca-Cola wares and vintage style signs. Sports fans could browse through a variety of sports memorabilia and collectibles. There were also a couple of booths promoting the 2016 International Plowing Match, taking place in Walton, Ontario in September 2017. One such booth promoted a quilt block challenge for which participants create a quilt block using only the fabric provided. The completed blocks will be judged and the winning blocks will be assembled into a quilt, which will be raffled off during the Country Side Meets Coastline quilt show being held in August 2017 at the Seaforth Community Centre. A short walk across the road to the Community Centre presented us with a varied selection of choices for Christmas gift shopping. 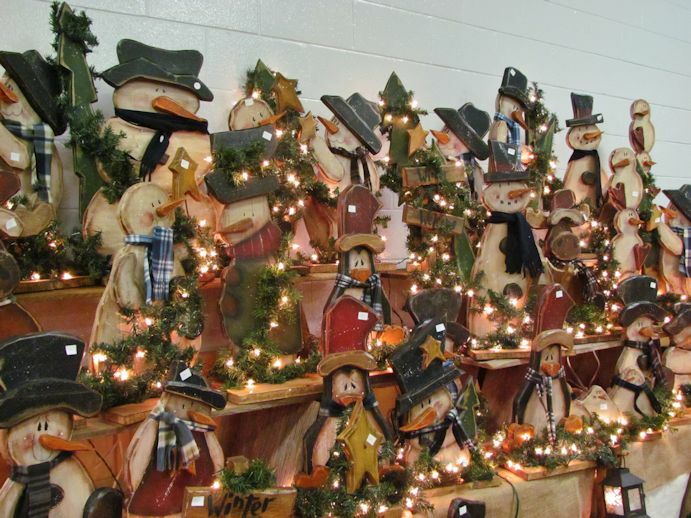 One wall displayed a heart-warming selection of wooden snowmen and penguins complete with twinkling lights. There were tables laden with a mouth-watering variety of home-baked goodies. My mouth said “yes-yes” but my waistline said “no-no”! 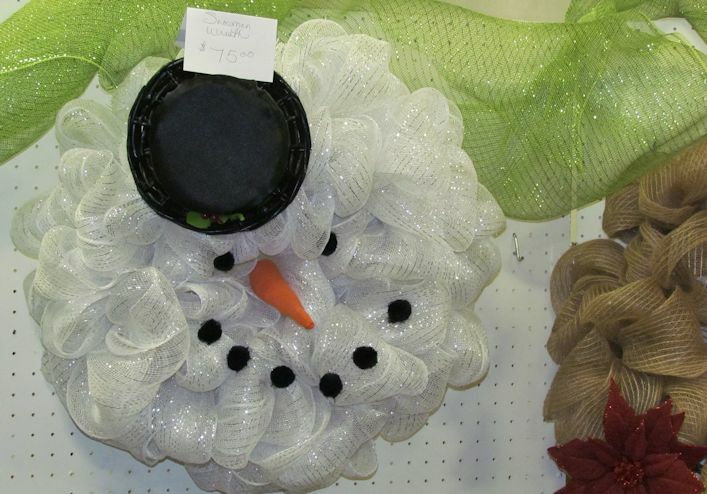 A number of booths offered home-made Christmas decorations, one of my favourites being a wreath constructed to look like the fluffy white head of a cheerful snowman. If bling is your thing, there were several styles, shapes and colours of jewelry to decorate fingers, wrists and necks. Another table I admired displayed lovely wooden bowls and vases polished to glow with a warm shine. Any little girl with a Barbie doll would have been delighted by the selection of beautiful home-made gowns displayed at another booth. As I have an eye for colour, I enjoyed looking over the bright and colourful Tupperware items artfully arranged on a table. If shopping made you hungry or thirsty, the Seaforth Agricultural Society operated a couple of concession stands that offered a variety of goodies to tempt your tummy. The Toy and Craft Show and Sale offers something of interest to young and old alike and is a pleasant way to spend a couple of hours and maybe pick up a gift or two. My son Jason is the guy with the Alis Chalmer display, great article.